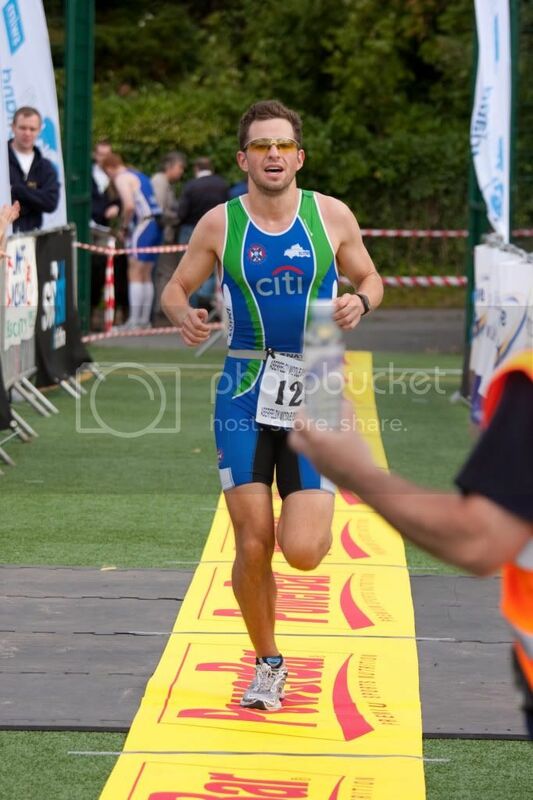 Crossing the finish line after a grueling race made me realize why I love triathlon/duathlon so much. Firstly the sense of achievement, knowing that you have pushed your body to its limits and that it not only survived but also gained you a good finishing time. Secondly it’s the camaraderie, although tri is an individual sport there is never a lack of support, encouragement and shared sense of achievement at any race. Finally, once the heart rate has reduced to a normal speed, I reflect on the race and although realizing I did my best, want to do better and cant wait to get back to training. 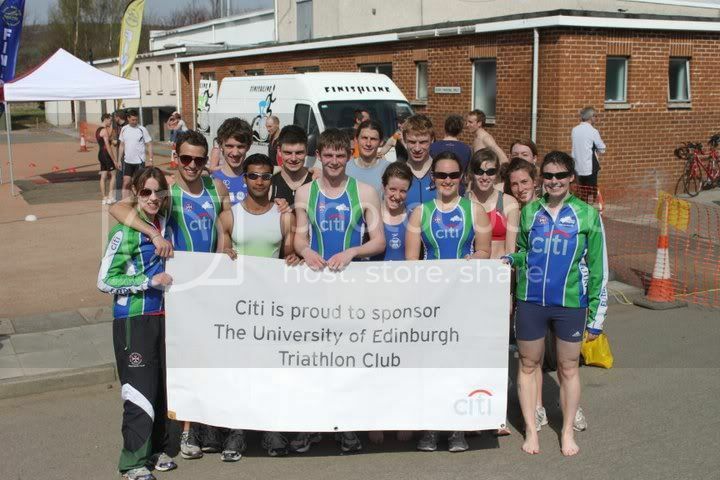 The ITU World Duathlon Championships was my first international race, and also my first race abroad. The prospect of racing in the heat of a Spanish late summer filled me with gloom and elation, likewise the fact that it was a closed route with no traffic to dodge or obstacles to face was thrilling and intimidating. James and I arrived on the Tuesday before the Sunday race. We justified this as an acclimatization period and spent the days pottering around in fairly nice weather, prepping bikes, going for wee runs, riding laps of the bike course and extensively sampling the local carbohydrates. In the build up to the race we both had the usual mix of nerves and the phrases such as ‘We’re just doing it for fun anyway’, ‘I think we will do pretty well actually’, ‘I’ll be gutted if I get under such a such a time’ and ‘Why the hell are we here? !’ were repeated in succession. Despite the nerves, I reminded myself that I had qualified for the worlds, and had done some great training. So come race day I knew that all I could do now was to push, push and push it harder. It was great meeting some of you at the sports fair through the week, and communicating with some of you over email. From the looks of things its promising to be a good year for EUtri! The club has been running roughly 12 years, and has been developing nicely throughout that time. What started as a few keen individuals has expanded into a substantial club of usually around 80 members, and every year the number increase. Along with members increasing the club equipment and facilities are also increasing so that now we also have equipment such as club bikes, swim paddles/floats; and additional training sessions such as spin, core and circuit sessions to get all triathletes into tip top shape! For me the nerves of a big race usually don’t kick in till the night before, or if I am feeling lucky, the morning of the race. However in a Middle Distance Triathlon, which is considerably bigger than any sprint triathlon I have done before the nerves kept me up at night about a week prior race day. I was a bipolar mess, on the one hand I loved the challenge of doing a half iron man, and Diana’s training program filled me with confidence. Also I enjoyed having the excuse of ‘I’m doing a Half Ironman next week’ as an opportunity to eat roughly 90% of my waking hours. On the other hand, I also felt under prepared having only done two open water swims (in which we splashed about more than anything) and a handful of sprint triathlons. The jump from sprint to middle distance was a daunting one and made me nervous, which made me eat more, if I didn’t do this race I risked turning into an elephant. Race day snuck up like a stealthy lion waiting to tear me to shreds, in fact, while I was forcing my breakfast down me at 6am I wished I was about to be mauled by a big cat as opposed to inflict arguably the same amount of pain on myself. I had come this far, had done some serious training and made my mum come up from the south to support me. There was no turning back. 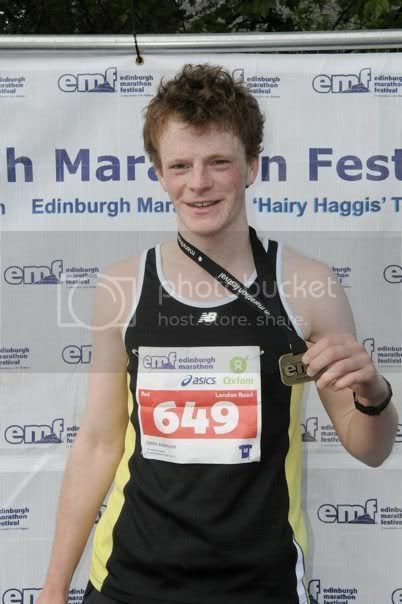 I decided to enter the Edinburgh Marathon last Christmas. I wanted a bit of a challenge and I had a few friends also doing it which would allow us to train together. After finishing your last exam on a Saturday afternoon most students would be straight to Teviot for a few pints to warm up before a night out at The Cheese. However, most students hadn’t signed up for a marathon the next morning… So as I left the exam hall I headed off in the other direction for another sort of party. A pasta party. Me, Ali and a few other mates who were also running loaded up on carbs then got an early night! After a good night’s sleep, I got up for a breakfast of porridge and honey, gathered my things then headed off to meet Ali. The weather was looking OK at this point - dry, and not a lot of wind or sun. Things were shaping up nicely. Then, just as we were dropping our bags off at the kit deposit a heavy rain struck. This wasn’t ideal but fortunately it was just a shower. Just as the nerves were kicking in we found our starting point where we only had to wait a short time before we were off. The day started off with a nice weather, as it was raining the day before. Being my first open water swim in a wetsuit (and swimming in cold water), I was rather nervous for the swim section of the race. There was a strong EUTRI club presence at the race, with Emma being the photographer of the day and several other club members warming up when I arrived with Joe and Angus.. Being used to swimming in a pool with clear visibility and less than 6 people in a lane, I struggled to ensure I was swimming in the right direction, while making sure I was not getting kicked and pushed by other people. The experience of open water swimming is so different. Soon I was out of the water and at the transition area trying to remove my wetsuit and put on my cycling shoes with my cramped left calf. I have recently been filling out the endless number of forms about my exchange experience and a particular question keeps appearing, for which I can’t quite formulate a response that wouldn’t be disastrously misunderstood. I hesitate as I type: “The times I spent running around a field with my friends, all of us wearing blue and green one-piece lycra suits”. Ok scrap that… perhaps: “I can’t think of more exhilarating than cycling over cobblestones in the snow, definitely an experience I would recommend”. I was transfixed by Ironman racing ever since Finbar had told me his tales of Ironman UK in 2009, but had always seen it as an impossible feat. 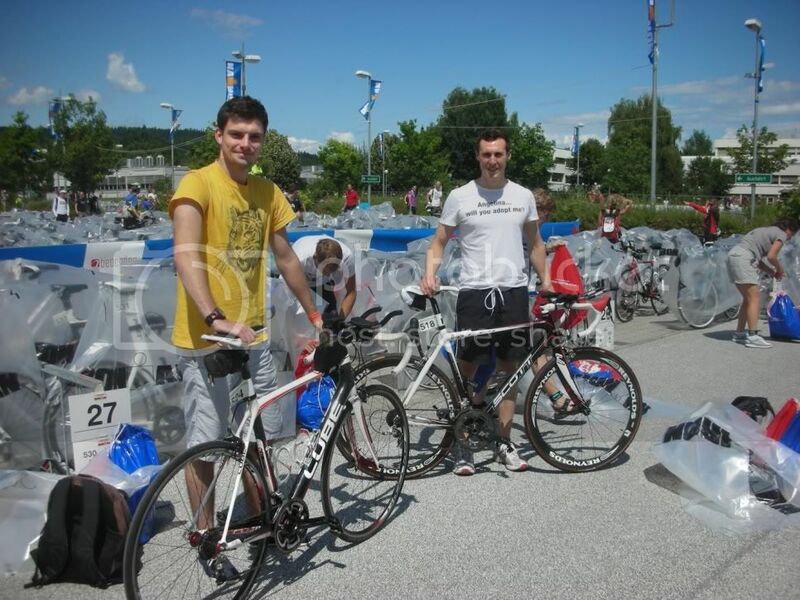 With university coming to an end though I took the plunge and decided on Ironman Austria as a fitting send off. The road to Ironman Austria began in May 2010 after competing in Midlothian Sprint triathlon, the only time in my triathlon career where I will sneak a victory over Fin, catching him on an off day. The next step was to try and secure an entry into one of the most popular Ironman races, selling out the previous year in a matter of days. So there I was at midnight on the 5th of July 2010, hunched over the computer hoping to get a slot for the following year. Ten minutes of frantic clicking and Fin and I both had a slot. At first I was delighted but then the notion of a 140.6 mile triathlon set in. What had I got myself into! Months of training passed, with highs and lows and plenty of road rage on Fin’s behalf. I managed to remain fairly injury free after September but picked up the odd niggle along the way, inevitable I suppose. Before I knew it I had arrived in Klagenfurt and was living a dream I never thought I would. Fin arrived a day later and we met up, registered, spent a fortune at the ridiculously overpriced expo and then joined a 4-hour queue for the much needed bike mechanic. Bikes were racked the following day and then the nervous wait began. 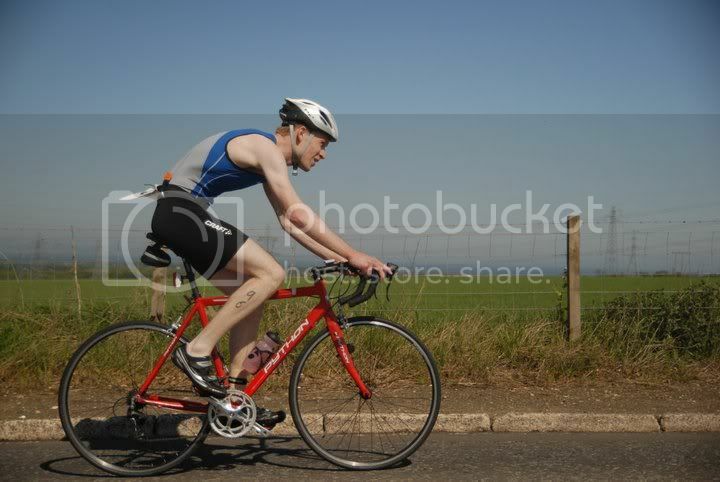 Having competed in my first triathlon only a month ago, it seemed no time at all before I was setting off towards the town of Dalkeith for my second. After a nightmare puncture in my first race I was still hoping to complete my first triathlon – this being the only goal for today’s race. I found myself constantly checking my tyres on the cycle out to Dalkeith, worried I would puncture again. Much to my relief, I arrived safely and was glad to see an excellent turn-out from EuTri – 18 of us in total. The day was promising to be a cracker as well - hardly a cloud in sight. The pleasant warmth (despite being 7.30 in the morning) reminding me that I should probably have brought some suncream. Thankfully I hadn’t forgotten anything else and I was able to set up transition before heading in to the pool to watch the first of the swim heats. By Mark Senn, Lynn Finnegan and Roisin Fahey. 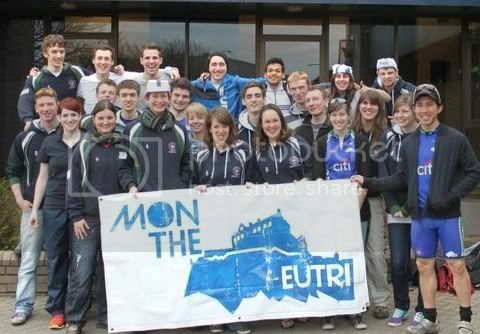 EUTri was out in force on the 10th of April despite the numerous logistical nightmares thrown there way (big thanks to Emma for sorting us out). While the rest of Edinburgh was asleep, 9 EUTriers + bikes packed into two small vans and one car made there way towards Cupar for East Fife triathlon. I couldn't have picked a sunnier day to take the plunge and do my first triathlon. I was all nerves while watching Nav put down a strong performance in the first sprint heat of the day, he was first out of the pool, and then it was over to me and Lynn in the second heat. A lot of splashing later and without being lapped by Lynn too many times, I could now settle down and enjoy the event. 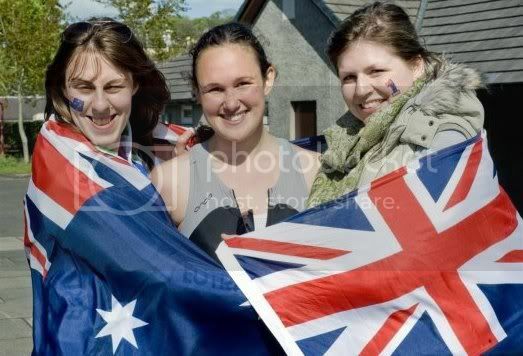 For me the fun really began on Friday when I went down to pick up the van for transporting the race day gear. Within the first 2 minutes I’d already managed to stall twice, possibly something to do with attempting to pull away in 3rd gear. I knew straight away the van and me would not get along. However after a shaky ride to Portobello we arrived to pick up the racks and we were soon on our way out to Tranent. We dutifully unloaded the 18 racks, checked out transition and I suddenly realised that the triathlon I’d spent months organising was really only a few hours away. Back at home, a worried Tesco’s delivery man rang the door bell, afraid I had accidently ordered 50 bananas as my kitchen filled with more and more food.